We always seem to short-change the past. The pyramids? Must have been aliens: those Egyptians couldn't have been smart enough to build them. The Eiffel Tower? Sure it's impressive but it probably should have fallen down decades ago: after all, Gustave Eiffel didn't have computers and modern witchy mixtures of alloys and composites. Bur our smug superiority is misplaced, our 21st century dismissal of everything created before the integrated circuit and plastic insultingly arrogant. The fact of the matter is that the past was more than grand, more than amazing, more than impressive. 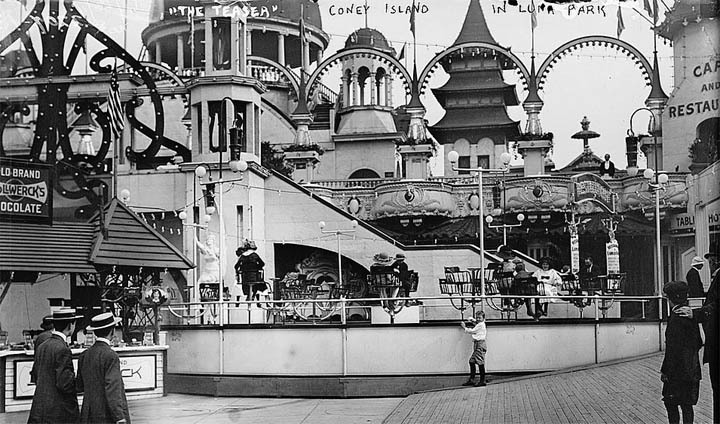 Take, for example, Coney Island, or, as it was called, The City of Fire, around the turn of the previous century. Originally just a tiny, sandy dot of land full of itchy scrub and wild rabbits -- or "Conies" which is where the place got its name -- the island became first a waypoint and then a tawdry vacation spot for the weary citizens of the Big Apple. 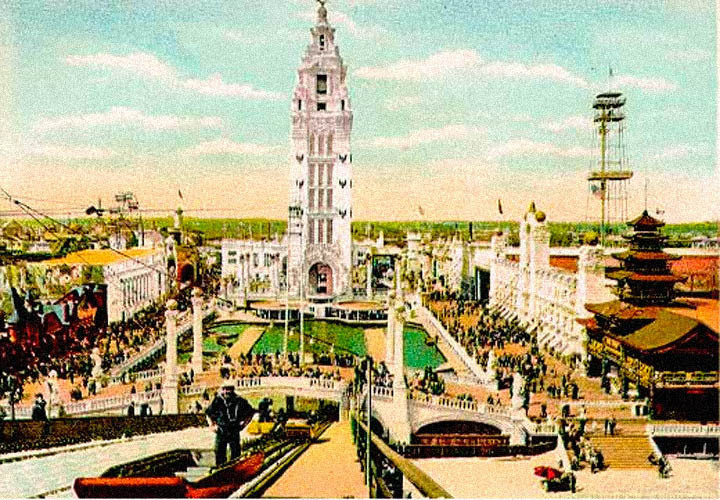 But soon Coney began to change, to become a phantasmagorical place: a world of wonders, dreams, and -- tragically as well as mystically -- a City of Fire. 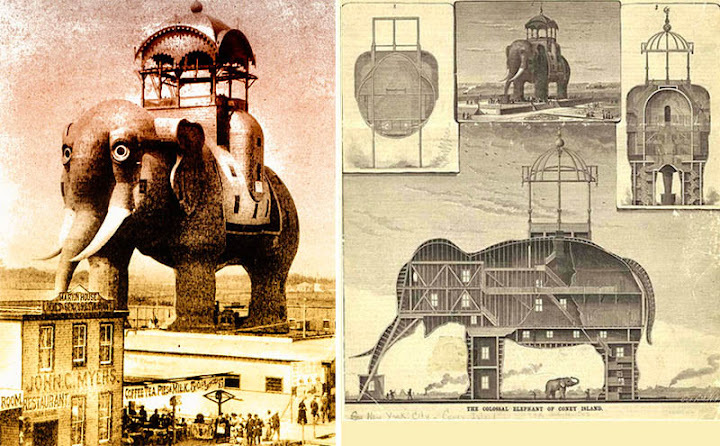 Take, for instance, Coney Island's elephant. 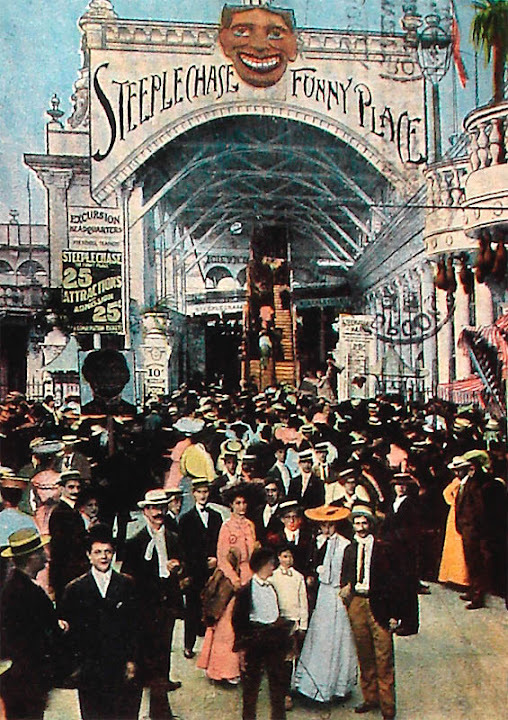 Created in 1885 by James V. Lafferty -- who also created Atlantic City's famous pachyderm, which still stands today -- it was one of Coney's first amazements. The elephant wasn't just a statue, some cheap tourist novelty. It was an actual, functional, five-storey hotel and, to give you an idea of what kind of world early Coney Island was, a brothel. But the elephant, while grand at the time and would have remained grand today like her sister in Atlantic City, was only a tusked taste of what was to come. In 1897, George C. Tilyou created one of the island's lost yet enduring parks: Steeplechase Park. It's hard to imagine what it must have been like to be a visitor to Steeplechase in those early days. No one had ever seen anything like it: wild and raucous, rude and amazing, Steeplechase was a playground of laughter and thrills. The main attraction were the mechanical ponies. Racing at almost dangerous speeds on a up-and-down and round-and-round iron track, the horses were thrilling, terrifying and, as someone perfectly put it: Gave the boys a chance to hug girls, and girls a chance to be hugged by boys. But the fun at Steeplechase didn't end with the ponies. Exiting riders, under the frighteningly cheery face of Tillie, the park's mascot, were assaulted by a clown and a dwarf. The clown would hit the boys with a cattle prod and try to blow the women's skirts up over their heads with a blast of compressed air. The giggling and shrieking boys and girls would then be allowed to sit on bleachers to watch other fun-seekers go through the same treatment. In what would be a common theme for the island, Steeplechase burned in 1907 but was rebuilt on a scale that's hard to comprehend for us 21st century folks. 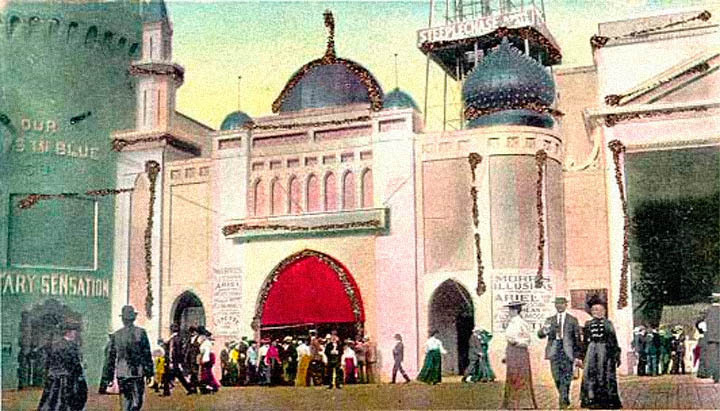 In addition to the restored mechanical horses, Tilyou also added an immense steel and glass "Pavilion of Fun" with dozens of other rude rides including the Human Roulette Wheel, the Barrel of Love, the Cave of Winds, and many contraptions guaranteed to make men and women alike shriek and wail with laughter. Steeplechase was amazing, to be sure. But it was mostly a broad and guttural place, acres and acres of architectural joy buzzers and whoopee cushions. 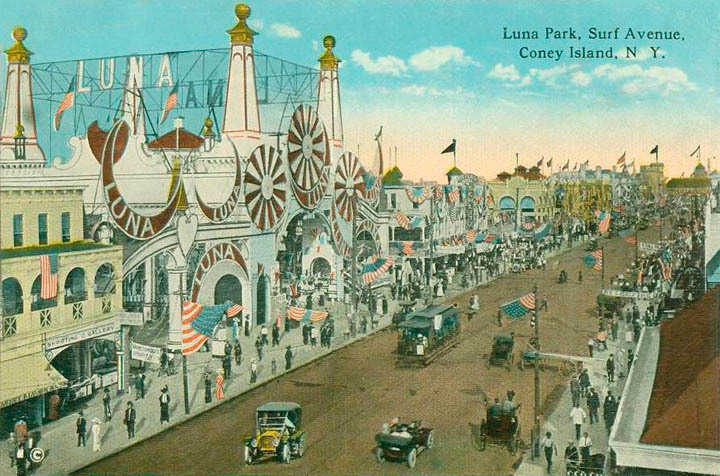 Then there was Luna Park, and with it Coney Island became a land of dreams. 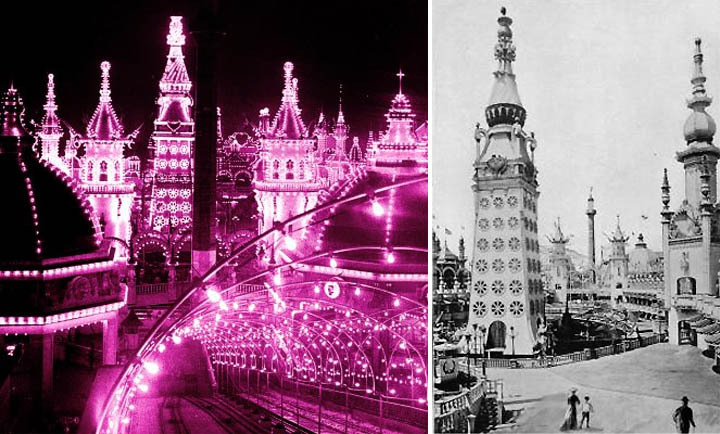 Built by Frederic Thompson and Elmer "Skip" Dundy, Luna was a hallucination, a disorienting vision of twisting minarets, undulating arches, and – at night – the brilliant spectacle of hundreds of thousands of then-novel electric lights. At Luna Park visitors were treated to rides – such as the famous soaking Shoot-the-Chutes, and the legendary animals, including the park's own herd of elephants – but, more importantly, they could walk the sprawling promenades of Luna Park and feel like they'd been whisked away from their ordinary lives in 1903 to a world of rapturous imagination: a world of fantasy made real. Albeit in lath and plaster. 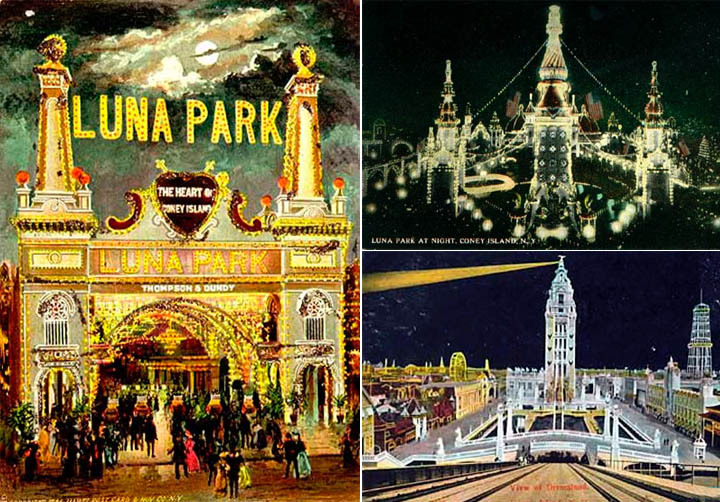 The spectacle of Luna Park's, well, 'spectacles' is staggering, even today: mock naval battles, including an attack on Manhattan by the combined navies of Germany, France Spain and even Great Britain, only to be beaten back by Admiral Dewey's fleet; a trip to the moon that included mischievous 'moon men'; a trip to the north pole by submarine; and too many more for this small space. 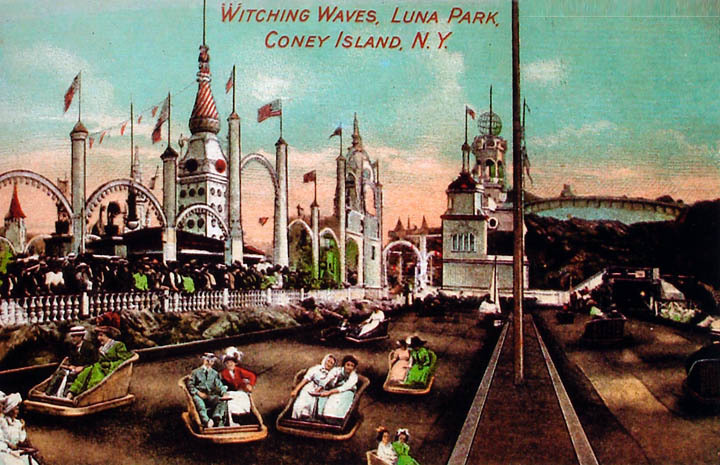 Luna also featured the world of the time, which for most people touring the park might as well have been the north pole or the moon: entire villages, such as Samoan's, were uprooted and placed in the park for the education – and amusement – of the visitors. 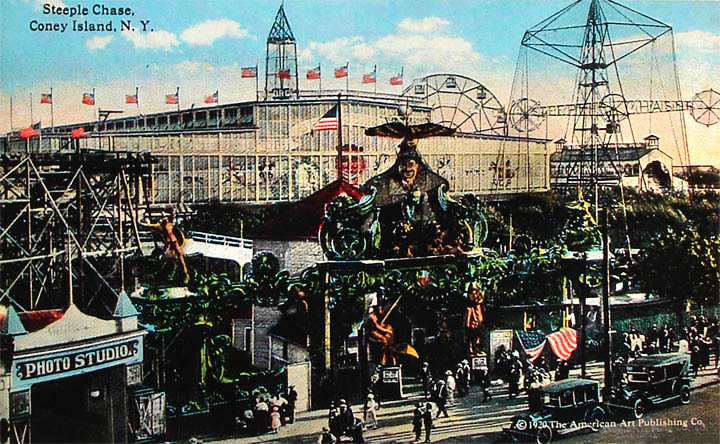 Luna Park is a legend, and with it, unprecedented spectacle came to Coney Island. But then came Dreamland. 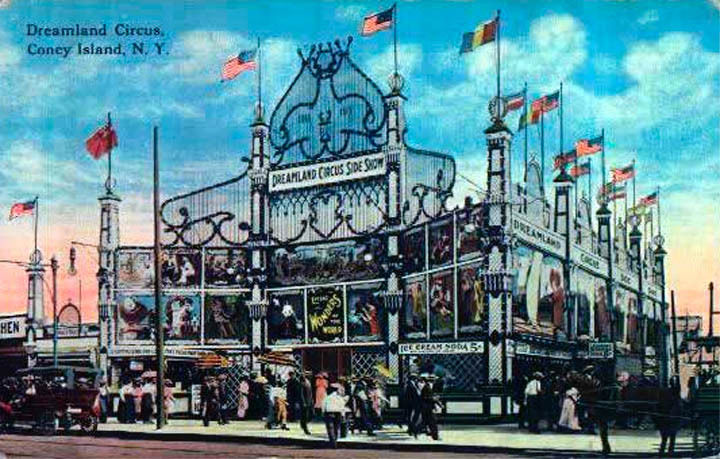 Built in 1904 by the very crooked William H. Reynolds, Dreamland was to be the crowning glory of the island, a factor-of-ten grander park than either Steeplechase and Luna. It's hard to picture imagine the scale and majesty that Reynolds made with Dreamland, the outrageousness as well as the beauty that he created on the island. 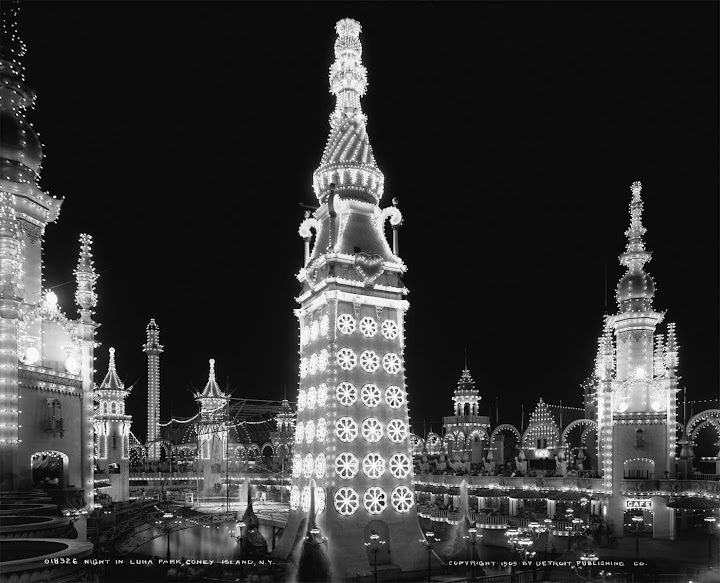 While Luna had a reported quarter of a million electric lights, Dreamland claimed to have more than one million: all of these lights giving the island its nickname of The City Of Fire. 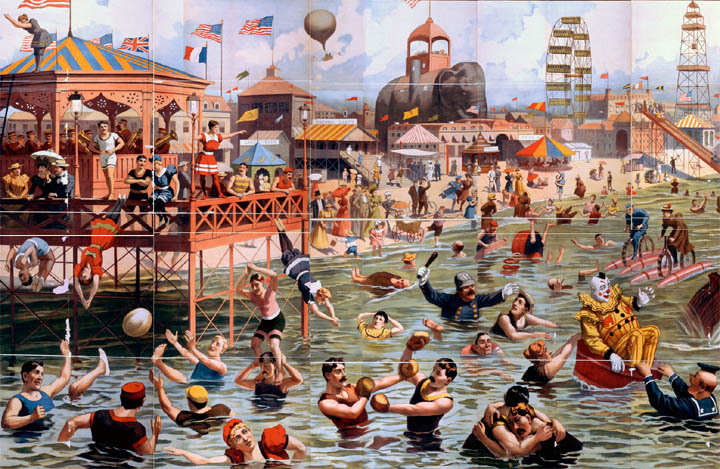 See the detailed panorama of Dreamland on this page - click here. 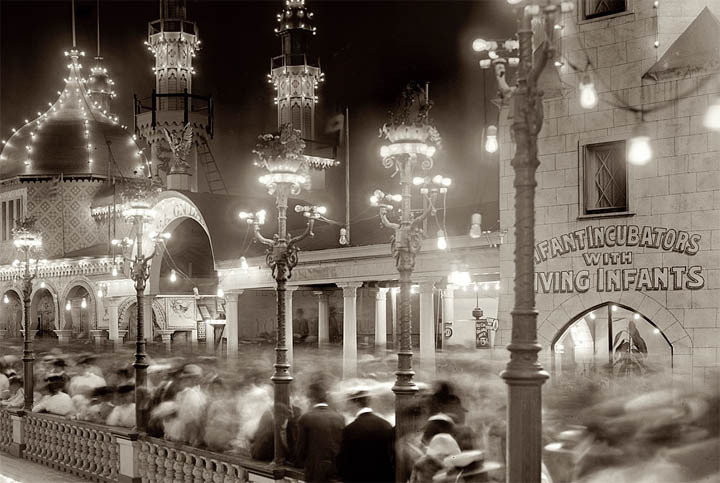 Dreamland was an entire dazzling world, a complete universe of dazzling spectacle. Every hour on the hour 2,000 firemen would put on a performance of extinguishing a roaring blaze in a six-storey building. An entire town was built – half scale of course – for the park's resident 350 midgets. 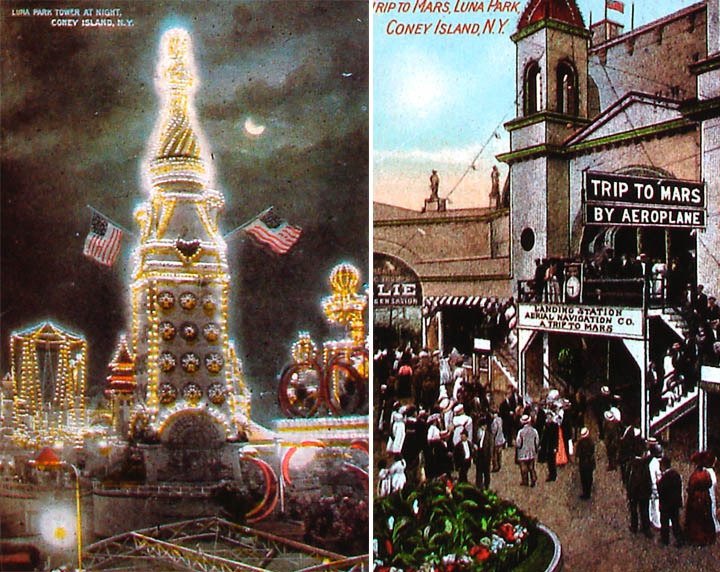 A 375-foot-high central tower lit up so bright it was often seen from Manhattan. There were also performances of the Biblical view of creation as well as a tour of Hell. And let's not forget the incubator babies. 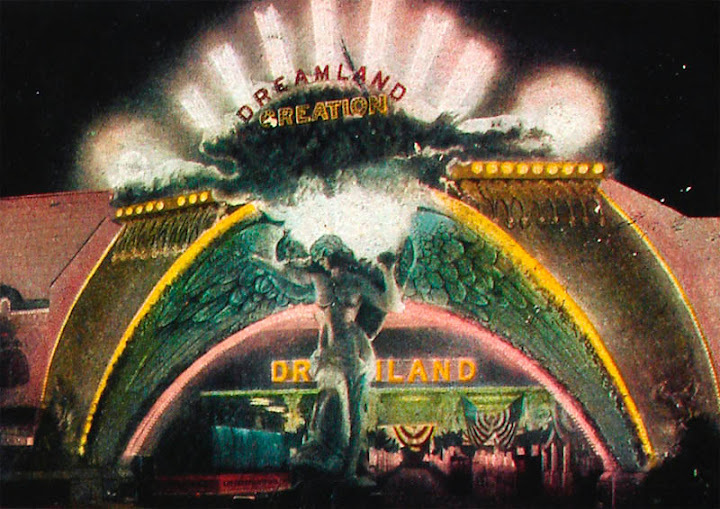 Yep, that's right: one of the most famous exhibitions of Dreamland were the baby incubators, compliments of the brilliant Dr. Martin Arthur Couney. Unable to get hospitals to take his inventions seriously, Dr. Couney worked with Reynolds and – through some showmanship – finally got the world to take notice of his technique to save the lives of premature babies. 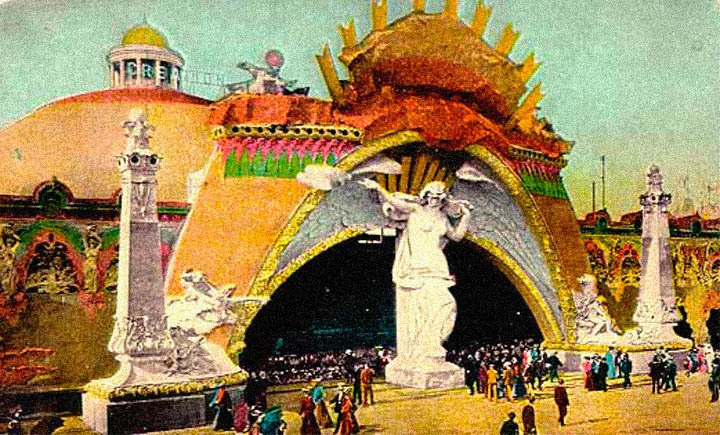 Unfortunately, as with that original elephant, Steeplechase, and many other Coney Island amazements, the City of Fire lived up to its name and Dreamland burned to the ground in a hellish blaze that, too ironically, began in the Hell Gate exhibition in 1911. Fortunately there were only a few tragedies, including a lion that had escaped from the fire and had to be shot by police. 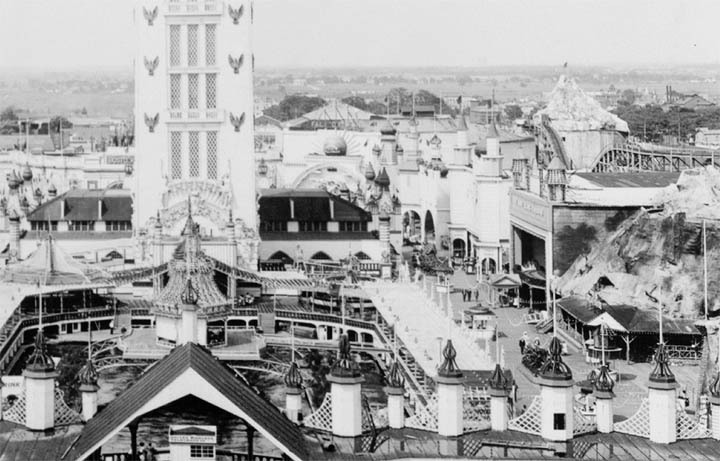 Unfortunately, the park never recovered and Dreamland became only a memory, the ghost of a dream for those lucky enough to have seen it before it became soggy ashes. Even more sadly, Luna and Steeplechase's appeal and popularity slipped away in the decades afterward until they collapsed into tawdry ruins, their majesty becoming tainted by the desperation and failures of their autumn years. 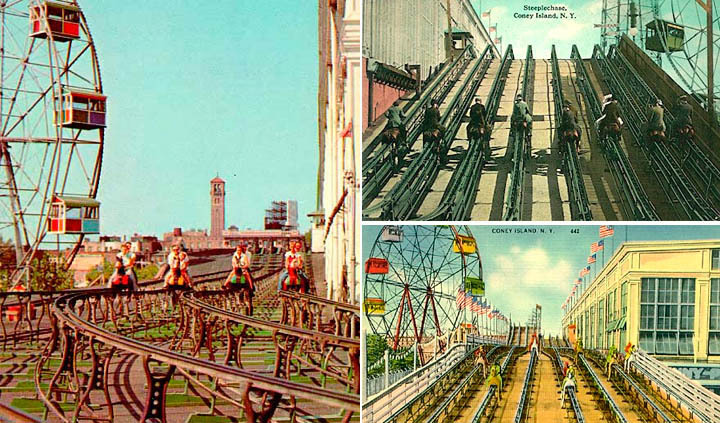 These days we have our Disneylands and dozens of other parks around the world and feel like we've managed something amazing – but then you look at the pictures of Coney Island in its heyday and realize that what we consider amazing now is actually small and cheap and easy. 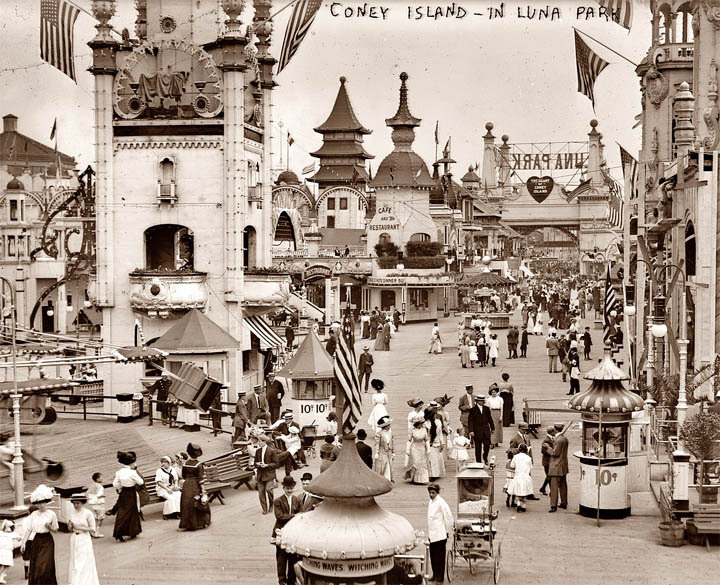 For truly wondrous playlands and amazing spectacles, you have to go back at least a hundred years, to Coney Island, to that legendary City of Fire. Here is a great short comedy video with a glimpse of some of the Luna Park attractions. Notice a problem with the looping coasters? 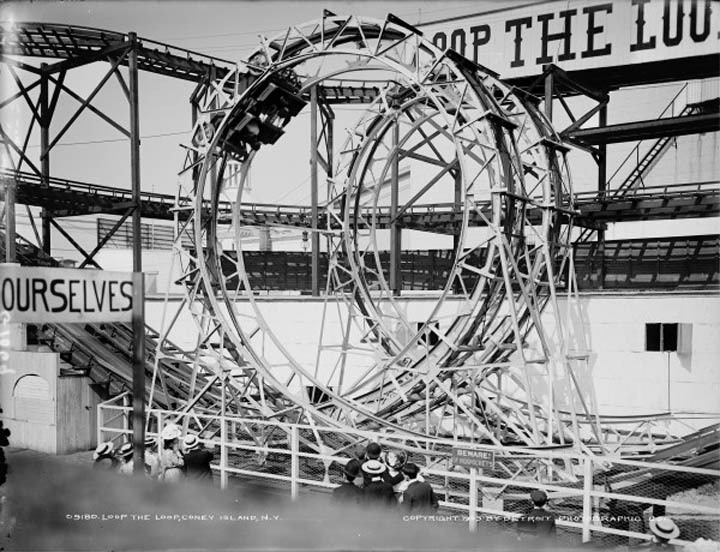 The loops are circles, not ellipsis like current roller coasters have. The riders would come down and very quickly experience high G forces in the circle instead of the gradual increase of forces in current designs. That caused several neck and back injuries. Thanks. Your site is always interesting and I end up spending hours at a time here. I love it! Thank you so very much for this post, I am a big fan of all things Coney. One of the strangest things in Dreamland, of which I have long wondered whether it really existed, was the Leap Frog Railway. Two railway cars passing each other on one set of tracks, by going over or under the other. Both cars had a set of curved tracks leading over the roof, for the other to pass over. It sounds too ridiculous to be true, but it is mentioned on some maps and picture postcards. Does anybody know more about this thing? 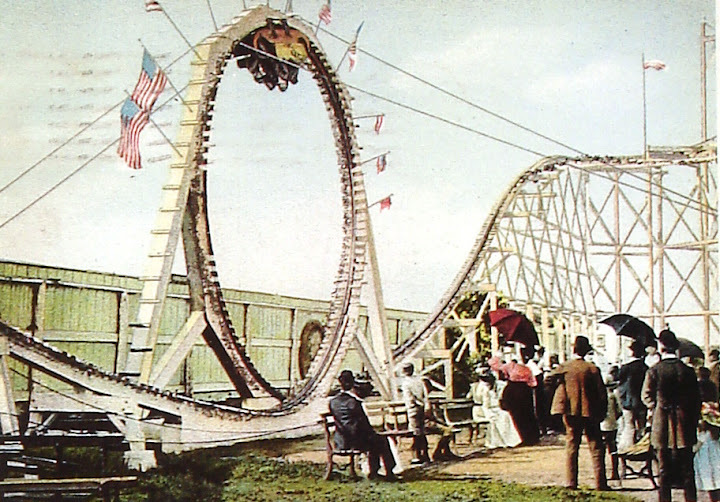 for intentionally killing the amusement parks and filling them with the horrible housing there is today.